﻿ ParkPatrol - The free ParkPatrol app delivers local parking officer early warnings to your iPhone anywhere in the world. 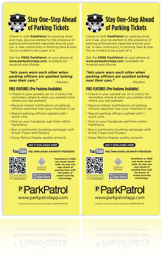 ParkPatrol app is both a FREE parking reminder app and a FREE community app. It's unique early warning system alerts you to the presence of parking enforcement near your car! Try it just... Park your car and check-in with two clicks to set the parking timer and location. Where ever you live, work or study be a part of your community by reporting parking officers when you see them. Its quick simple and fun! We’ll track all reports & alert every checked-in user when a report is nearby. Spot an officer, open ParkPatrol and click Send Alert! It's easy and satisfying knowing you've contributed to the community not to the pockets of the municipality or council. If you have another 5 minutes, wait and report the officer a second time from a new location. Made a mistake? Just "Shake to Delete"! ParkPatrol maps all enforcement officer reports using our own system of servers and databases, so when the community acts together we become a powerful data gathering and reporting tool. We call this system CRWD POWER - a groundbreaking community based infrastructure designed to help you stay one step ahead of parking tickets. Once parked, start ParkPatrol and click the green button. Set your time and range to cover your car. The confirmation is a car icon on the map. Now relax. Close the ParkPatrol app and keep your iPhone near by. Audible alerts will be sent to your phone and will pop up as a notification! Clicking an alert takes you straight to ParkPatrol's map to see the exact reported location. You may never have to pay parking tickets again. Just a single click on ParkPatrol reveals where your car was parked and when the parking timer will expire. When that timer expires, are you going to walk or run back to that car? This is the ParkPatrol advantage to help you avoid parking tickets. Would you rather pay for something you need, or pay parking fines? Check out our Frequently Asked Questions page for more help. Because ParkPatrol works best within a community, such as employees, residents, or students. We've prepared printable flyers, stcikers and posters to help you out. Need more people in your area using ParkPatrol? Run a campaign! Write to your newspaper, television and radio. Post flyers in the student union, in your employee break room, at the local cafe. Drop them into mailboxes, slide them under windshield wipers or email them around. Parking locations and sighting reports are private and contain no personally identifiable information. CRWDPOWER.COM treats this information with respect and does not make it available to any third party. The information submitted is used only for the stated purpose of sending early warning alerts. We also ask you to use this app responsibly and with respect for others. Please write to us with any questions or comments. © CRWDPOWER.COM 2011. All Rights Reserved.